The VISTA Headspace Inspection platform is an automated in-line 100% inspection machine designed to simultaneously monitor oxygen, pressure, and moisture levels in sealed parenteral containers. 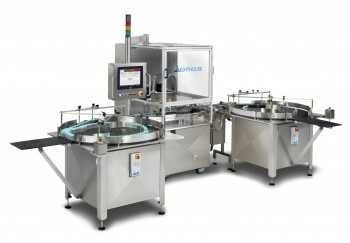 The patented machine platform was originally developed with funding from the Food and Drug Administration and received the 2004 Parenteral Drug Association New Innovative Technology Award. The VISTA/P In-Line Pressure/Moisture Inspection System is an in-line, 100% inspection and rejection system that can be configured for the simultaneous inspection of headspace pressure and moisture. Designed for monitoring nitrogen pressure and/or vacuum levels in sealed parenteral containers as a means of leak detection, the VISTA/P System is also capable of simultaneously measuring headspace moisture levels for 100% moisture inspection of freeze dried vials. The non-destructive nature of the measurement enables a full statistical documentation of system performance.